A growing number of customers are enjoying an impressive open vista of their garden. Bifold doors concertina sideways to give you a large unobstructed opening and allow natural light and fresh air to flood in. This gives great appeal in the summer months providing a real sense of freedom. You might choose these for a rear-facing living room or an open-plan kitchen-diner for al fresco style dining. If you currently have sliding patio installing bifold doors will open up the whole door frame which will make it appear much larger. We can also provide all the services needed to increase the size of your door aperture. These can also be installed to the interior of your home to provide a chic and stylish look creating a feeling of movement between living areas and extending the reach of natural light to internal rooms. These can be made of aluminium or uPVC but the most advanced performance is provided by ones made in aluminium which is extremely strong and very stable in direct sunlight and other weather extremes. They require very little maintenance and offer an excellent level of insulation. 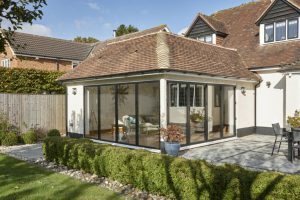 Because of its strength aluminium frames are much narrower and less obtrusive than uPVC or timber, thus creating a clean and clear view even when closed. They open effortlessly gliding on stainless steel rollers and are characterised by state-of-the-art smooth contours. There are many colour options for finishing these so your choice of fittings can be made to complement the decor of your property. Using the same system as our SMART aluminium bifolds we offer shop fronts in a wide range of colours, low mobility thresholds, anti- finger-trap hinges and advanced security. 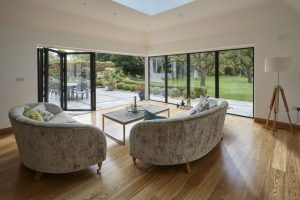 For more information or to make an enquiry for bifold doors in Hitchin, Milton Keynes and Luton, please feel free to contact us.